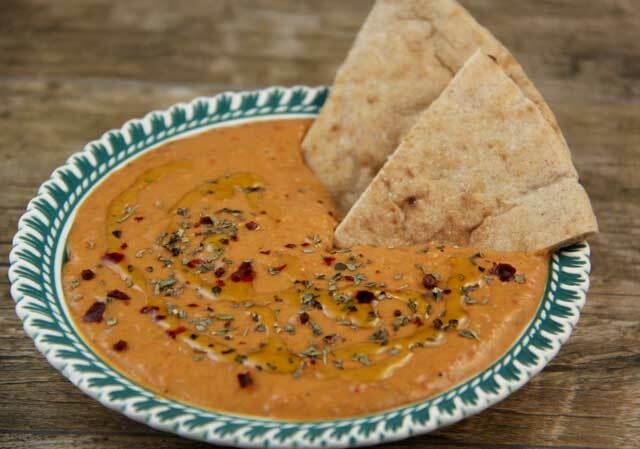 If you are looking for the perfect dip for your pita or cut vegetables, try this lively red pepper hummus. Sautéing the peppers is the key to this fabulous Mediterranean Diet recipe. Capers, lemon and spices give it added zing. Hummus is popular across the Mediterranean, including in Israel, Greece & Lebanon. It is the perfect food for deliciousness while still filling you up and being low in calories and high in protein and fiber. It’s a wonderful choice for a healthy dish when serving appetizers or served in a salad or sandwich at lunch. Red Pepper Hummus will last most of a week in the fridge so it is perfect for quick snacks and lunches. If you have ever had hummus from Lebanon you probably have noticed that it is creamier than most other types of hummus. The trick to a creamier hummus is very simple and you can use it with this red pepper hummus recipe. Near the end of the processing, have a very cold 1/4 cup of water. Add 2 Tablespoons of the water to the processor and blend for a few seconds more. Check the creaminess. If it’s not quite where you want it then add the other 2 Tablespoons. If you do add the water, you may need to adjust the seasonings a bit, but not much. That’s it, creamy hummus! Hummus is one of the best Mediterranean Diet recipes for quick snack, lunch and dinner prep. For lunch or dinner, serve on a salad. It goes great on our Almost Traditional Greek Salad or even just on a simple lettuce, cucumber and tomato salad with Dijon Vinaigrette. You can also stuff a pita with red pepper hummus and veggies and top with the Dijon Vinaigrette. If the pita sandwich isn’t quite enough, you could have it with a light soup. I would recommend Chicken Leek Soup with White Wine. Sauté red pepper in 1 Tablespoon olive oil until skins begin to brown. Add vinegar and capers, sauté for 1 more minute. Turn off heat, let cool. Add all other ingredients (including red pepper mixture) except the reserved chickpea liquid. Slowly add reserved chickpea liquid, if needed, to achieve desired smoothness and consistency. Salt and pepper, to taste.